Finally, on 7 May, 2018. AOMEI Backupper Network gold version 1.0 released! 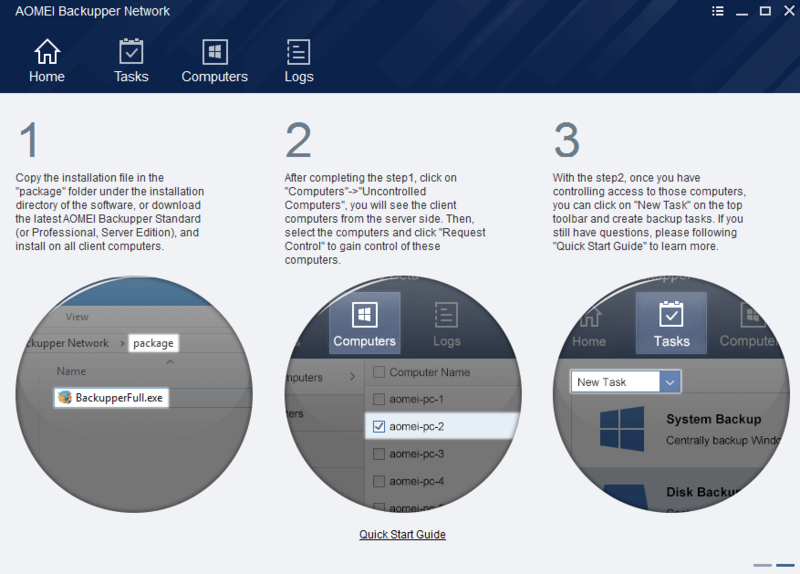 From its name, we know it’s a tool for managing computers in the same LAN via network. Maybe it is because we always keep close attention to the development and progress of AOMEI Backupper Network. But for some users, they may think AOMEI Backupper Network is the same product as AOMEI Backupper, just as a new edition. No! They are not the same tool. 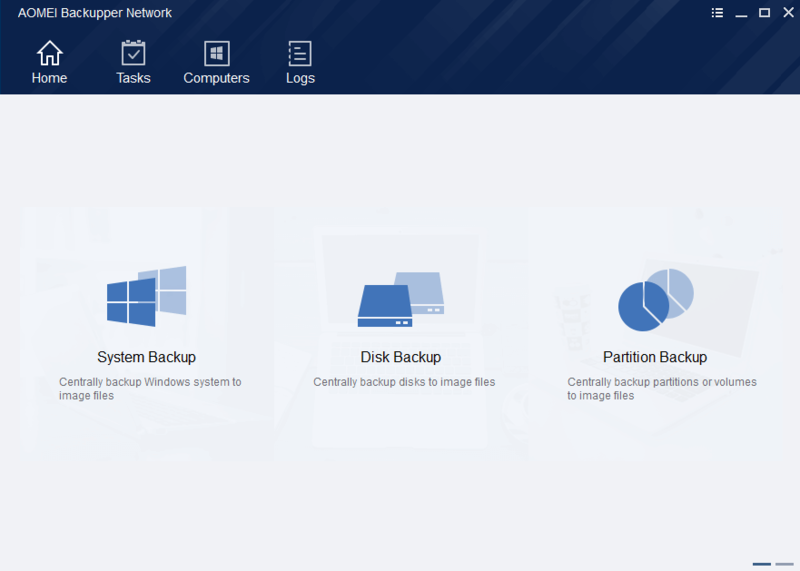 AOMEI Backupper Network and server backup software – AOMEI Backupper Server, AOMEI Backupper Technician’s interfaces are absolutely different! AOMEI Backupper Network is a free and new centralized backup management program that’s designed to help you create and manage backup missions for all desktop PCs, laptops and even virtual machines within LAN from a single central management computer. If its name change to AOMEI Central Manager, maybe it is easy to understand. Next, let’s see what AOMEI Backupper Network can do. With the help of AOMEI Backupper Network, you could cut down backup administration costs and save lots of time. You can use a computer as a central server to start, schedule, stop and monitor remote backup tasks for all clients in the network. Once you have installed this AOMEI Backupper Network on the master computer and the clients those you’d like to backup installed AOMEI Backupper, it becomes very simple to centrally manage and backup system, disks as well as partitions on client machines to a storage or even network share and NAS. AOMEI Backupper can backup file and do file sync, it is a pity that AOMEI Backupper Network 1.0 doesn’t support these. AOMEI Backupper Network 1.0 also can’t do clone tasks. By the way, AOMEI released AOMEI PXE Boot and AOMEI Image Deploy before AOMEI Backupper Network. Thus, we believe AOMEI Backupper Network’s functions on backing up through network. Except central backup feature, AOMEI Backupper Network has automatic scan, cross-segment backup abilities. Before controlling clients, you should scan and list online computers and then select needed one, at last, send request. 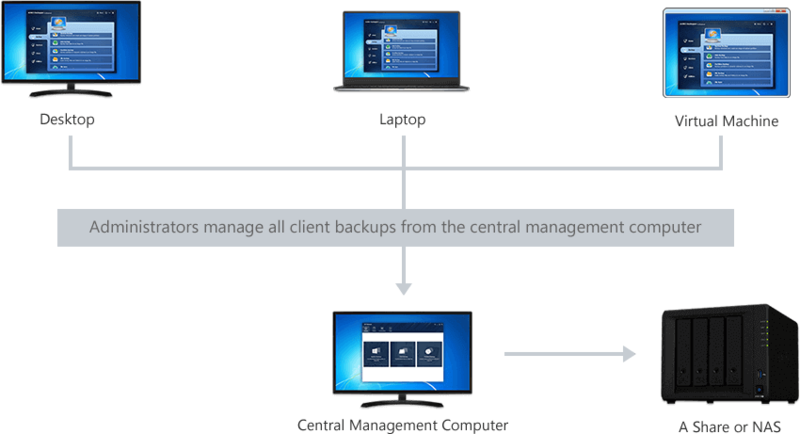 The latter means supporting to backup client machines in IP segments that differs from the central computer. AOMEI Backupper Network inherited backup functions from AOMEI Backupper, such as schedule backup, complete backup settings (including add comments, encryption, compress backup image file, split backup images, etc.). Other additional options like logs report, email notification. AOMEI Backupper Network could protect computers within the LAN through network fully.